While Intel's next-generation Broadwell processors for most Macs are not shipping until early 2015 or even later, the company began shipping some ultra low-power Broadwell chips known as Core M a couple of months ago. These chips are designed to run at just 4.5 watts and are intended for next-generation fanless PCs and tablets, fitting perfectly with circulating rumors of a thinner, fanless 12-inch MacBook Air, potentially with a Retina display. The first batch of Core M chips launched in early September consisted of the 5Y10/5Y10a running at a base frequency of 800 MHz with a maximum of 2 GHz turbo, along with the more powerful 5Y70 running at 1.1 GHz with a max turbo of 2.6 GHz. 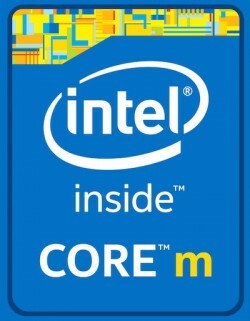 But as pointed out by CPU World, Intel now appears to have quietly added several new processor options to the Core M family. Internal roadmaps had targeted an early 2015 launch for these chips, but Intel's chip database shows the new chips as having launched this quarter. The new chips, which we understand Apple has indeed been testing with the upcoming 12-inch MacBook Air, include a new high-end 5Y71 chip running at 1.2 GHz with a max turbo of 2.9 GHz, two new mid-range chips arriving as 5Y51 and 5Y31, and a new low-end 5Y10c variant. As noted by CPU World, all of the new chips offer faster graphics than the initial batch of Core M chips, with base graphics frequencies moving from 100 MHz to 300 MHz across the board and turbo frequencies in some cases rising slightly to as high as 900 MHz. Lenovo's Yoga 3 Pro is the first PC to take advantage of the first batch of Broadwell Core M chips, and performance has been lackluster. It is unclear, however, whether the issues are due more to Core M's limitations for the sake of power efficiency or to Lenovo's design decisions. Still, the new second batch of Core M chips appears to mark a significant step forward from the earlier versions while maintaining the same low power draw. The launch timing of Apple's rumored 12-inch MacBook Air remains up in the air, with one rumor pointing to a likely mid-2015 launch. But with Intel moving forward on its Broadwell Core M chip lineup and perhaps accelerating its launch plans for those chips, it will be interesting to see if Apple looks to launch the new, thinner MacBook Air earlier in the year. Damn why didnt the new mac minis wait for these. You want the mini to get even worse? Introducing the 2015 MacBook Air. It has a processor speed from a decade ago, the same amount of RAM as a decade ago, the same amount of storage as a decade ago and finally to round things up it has the same price as a decade ago. But look at how THIN it is! And introducing the "new" Apple logo, rainbow-colored. looks more like a downgrade. and this time i won't be surprised. so slim, Apple removed the battery. Like the new Mac Mini. isnt it completely obvious that this 12" macbook air and the 12" ipad pro are one and the same device?! So... relatively weak (but power efficient) processors... and Retina in the new Macbook Air? I will wait for Anandtech benchmarks. Once form starts gimping performance, one needs to reevaluate priorities.